Tweeter grabs meta information of the track being played in iTunes and automatically updates your Twitter and Facebook status with that information. Want to share what your currently listening to in iTunes to your Twitter and with Facebook friends? Today we have an noteworthy app for Mac, called Tweeter, which grabs meta information of the track being played in iTunes and automatically updates your Twitter and Facebook status with that information. It is a tiny yet powerful menu bar app for Mac, which can keep your friends and peeps well-informed on your music selection. Tweeter supports most famous online music service – last.fm and Amazon for appending direct URL to tweets, it supports Growl notification service to let you know about the latest tweet or status, which is being published at the respective social media site. Using Tweeter can start some conversation on your Twitter timeline with your friends as I’m sure they will voice their opinion on your music taste. Additionally, it comes with iTunes playback controls to jump between current playlist tracks, rate current song, and turn on / off the playlist shuffle mode. The status auto-update feature is completely controllable so you don’t have a new status getting thrown up every time you change a song, which was my first concern when reviewing this app. 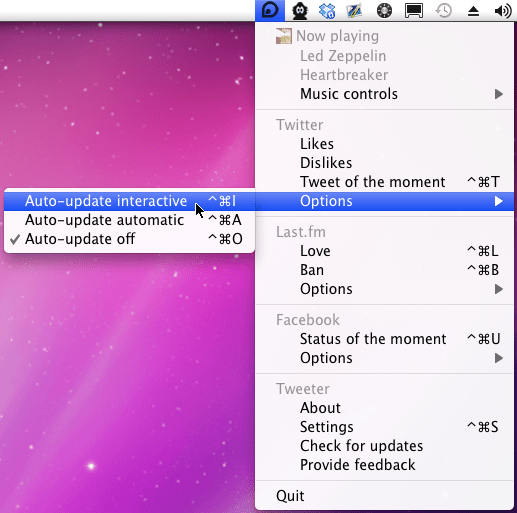 You can set auto-update time interval or completely disable it to tweet or update Facebook status at your will. After launching the application, from Tweeters menu bar drop down menu, bring up the settings to provide Twitter, Facebook and last.fm account details. From the ‘Messages and General’ window, you can customize Like and Dislike Tweet messages and toggle keyboard shortcuts on/off & configure generic settings, respectively. Once the account information is verified, launch iTunes and play any song whose meta information you wish to publish. Now in the menu bar options, you can click ‘Tweet of the moment’ and ‘Status of the moment’ to tweet and update Facebook status with current track info. 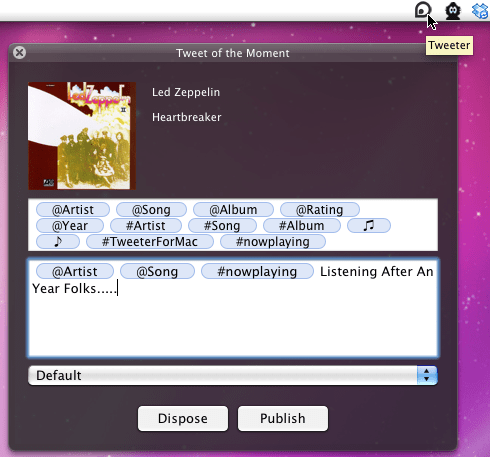 The screenshot shown below displays a dialog box for publishing tweet with meta info of the current track. To add a meta tag, just drag the meta tag to tweet area followed by writing the message and click ‘Publish’. 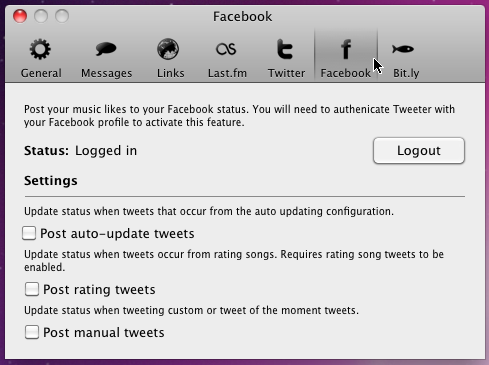 Tweeter is only available on Mac OS X 10.6 or higher and on the plus side, it is 100% free! Give it a try now!